As I sit here this weekend, working around the clock to try and get everything ready for the WBCA Hall of Fame Museum, a task came across my desk that has brought back a lot of memories. The assignment was writing a 250 word or so profile of Wesley Matthews from Madison Memorial for the “Top Players of the 2000s” section of the exhibit. It’s pretty easy to scribe, the facts lay out nicely – led the Spartans to their first state title as a senior, won Mr. Basketball and Player of the Year as a senior, scored 1322 career points, 2 time AP All-State selection, solid career at Marquette, NBA Superstar. However, just as Brian Butch holds a spot in WSN lore, in a way so does Matthews. As I’ve written in the past, in 2003 we broke Butch’s commitment to Wisconsin, really putting us (at the time known as WisHoops.net) on the map. Our very first office in 2003 was over by the Rimrock Road exit of the Beltline. I’ll never forget the day the office manager brought in a student that had been helping out with some office work that had said he played high school basketball and knew about our site. So I said hi and asked his name and lo and behold it was Wesley Matthews. At the time he was a sophomore in high school and with his well-documented lineage was the focal point of a lot of criticism on places like internet message boards. Internet message boards like the one we had on our site. Now, you may ask how I did not know who it was. Well, I had never been our basketball scout or basketball writer. I was always the man behind the curtain pulling the switches to make us go. But of course, by name I knew who he was. And to be honest, it was the first time that it dawned on me that these are real people and just high school kids that people are anonymously bashing on our website. And he never even brought up our message board, but all I could think of to say to him was that I was sorry people were idiots on our site. It really motivated me to start cleaning up the message board a bit, as hard as it was at the time due to the immense amount of traffic. Over the next two years, even if I wasn’t our basketball writer, it was impossible to avoid Madison Memorial and Wesley Matthews. They were the “it” team of high school basketball and you could see the balance of power in local high school hoops shifting over to Gammon Road. As with Butch before, we were on the verge of breaking the story of where Wesley decided to play his college ball. If I remember correctly it was the summer before his senior year. As silly as this sounds, our two sources were two of his AAU teammates that he told the weekend before during a tournament. Our writer at the time tried to reach out to Wesley and his mom to confirm the story. He never got a hold of anyone, never got a call back but decided to publish the story. We broke the story of Wesley Matthews committing to Marquette the day before his press conference. Instead of being celebrated like with the Brian Butch story, we were vilified, especially on Marquette fan message boards. Now, I do think the comments went a little bit overboard. I do not think we ruined Wesley’s life by taking away his surprise that he wanted to tell in person. However, it taught me a valuable lesson that it is the player’s and the parent’s decision on how this news gets delivered – not ours. I cannot tell you the numerous times since then that we have sat on stories, even sometimes to watch others break them, because we give people our word that we will not release it. As we all know, Wesley is now in the NBA and the thing I find most fascinating about the Wesley Matthews “story” is how he got there. Again, we all know the facts – undrafted out of college, impressed in workouts, made a team, earned minutes and then signed a huge deal in Portland. While that is a great story, what always amazes me more is what he had to have done to make it happen. There is a reason this thing usually doesn’t happen in the NBA, while they don’t always pick the right guys it’s rare for someone undrafted to do what he did right away. There have been enough cases of players going to Europe or the DLeague and improving and coming back, but not right away. However, if there is one thing Matthews had shown ever since that sophomore year of high school was that the next season he was going to come back improved, almost exponentially so. He was an outstanding athlete and outstanding athletes can do very well on the high school and even sometimes the college level. However, if you want to play in the NBA you have to be an outstanding basketball player and that is what Matthews was able to turn himself into. You could see it starting in high school, by the time he walked off the Kohl Center floor with the gold ball, he was certainly more polished of a player than when he was there the year before. You could also see it at Marquette, he went from the third option of the “big three” along with Jerel McNeal and Dominic James to the co-first option with McNeal as a senior. He went from a 28% three-point shooter as a sophomore to a 37% shooter as a senior. Speaking of shooting, after watching an NBA draft last Thursday, where every other wing they talked about “struggled” as a shooter, you can tell that was the one part of Matthew’s game that he worked relentlessly on. As a rookie he shot 38%, a better percentage than his last year of college and four feet further out no less. He has hovered around 40% ever since. I can only imagine the countless hours he put in at the gym to perfect this, to get better, to make himself an NBA player. I can only imagine what he has in store for the future, but I know one thing, nothing he will achieve or accomplish will surprise me. About the WBCA Hall of Fame Museum – The WBCA Hall of Fame Museum is at the JustAgame Fieldhouse in Wisconsin Dells. It features over 300 linear square feet of Wisconsin high school basketball history. To celebrate the opening of this exhibit, along with going over $2 million raised for the MACC Fund, the WBCA is throwing a dedication weekend celebration on August 16th & 17th. On Saturday, August 17th, we will be bringing back some of the greats of the past 25 years of high school basketball in our All-Star Alumni Games. The women will get it started at 10am, followed by the high flying Milwaukee Buck Rim Rockers and finishing up with the men’s game. All throughout the day we will have free food, contests for & young alike, mascots and much more. Following the boys game we will have a brief dedication ceremony. In the early evening we will have a social at a to be determined location in the Dells. 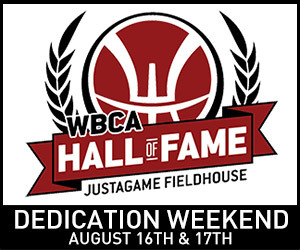 The Saturday event is free to all WBCA members, Hall of Fame indcutees and their families, we just ask that you RSVP to the event along with how many people you expect to attend. We need this RSVP so we know how much food to order and we need you to login/register with an account so we can verify that you are indeed a WBCA Member. The general public can also celebrate with us for a small entry fee of $7 adults and $4 kids. Entry includes a cookout lunch. Also on this registration form is the opportunity to buy presale tickets to an event also at the JustAgame Fieldhouse the night before on the 16th. This will be the WBCA Legends game and will feature former Wisconsin high school standouts that are currently playing professional basketball. While the NBA guys were not allowed to play by the league, we will have several of them on hand to coach the teams and to sign autographs afterwards. There will also be contests and give-a-ways though the night. Tickets to this event are only $5 for adults and $3 for students 3 and under is free. WE EXEPECT THIS EVENT TO SELL OUT.